Following a jury trial, the court denied defendants' motion for judgment as a matter of law that they did not willfully infringe plaintiff's patents in light of the Supreme Court's intervening decision in Halo Electronics, Inc. v. Pulse Electronics, Inc., 136 S. Ct. 1923 (2016). "[T]he jury found that [plaintiff] had proven by clear and convincing evidence that Defendants willfully infringed the asserted claims. . . . [A]fter the jury returned a verdict, but before final judgment, the Supreme Court determined that the Federal Circuit’s two-part test for enhanced damages was inconsistent with 35 U.S.C. § 284, repealing [In re Seagate Technology, LLC, 497 F.3d 1360 (Fed. Cir. 2007)]. . . . By returning a verdict of willful infringement, the jury found that Defendants acted 'recklessly' . . . and that they 'actually knew or should have known that [their] actions constituted an unjustifiably high risk of infringement of a valid patent.'. . . Because the jury’s finding was made under the higher clear and convincing standard, the Court upholds the verdict and moves to the next stage of the enhancement inquiry." The court issued a pretrial order prohibiting counsel and the parties or their agents from contacting potential jurors. "In order to assist counsel in preparation for voir dire, the court intends to provide a list of potential jurors that will form the venire in this case a few days prior to the start of trial. . . . All attorneys, parties, and their respective employees and agents, including jury consultants, are prohibited from personally or through another sending an access request to the electronic social media platform of any juror or potential juror, including for example a Facebook friend request or an Instagram request to 'Follow' that juror. Other forms of ESM include LinkedIn, Twitter, and Instagram. . . . All attorneys, parties, and their respective employees and agents, including jury consultants, are prohibited from conducting or causing another to conduct any type of investigation by which a juror or potential juror may become aware that his or her ESM is being reviewed or scanned. . . . This of course requires that any individual using ESM to investigate jurors review the terms and conditions, including privacy features, which change frequently, as well as his or her own network settings before investigating jurors on such platforms." The court granted plaintiffs' motion to disqualify defense counsel because of the appearance of impropriety. "The current configuration of counsel presents an inescapable appearance of impropriety. . . . The attorney in question worked for 186.7 hours on [plaintiffs'] patent infringement claims and in representing it before the patent office. . . . For over seventeen months during the pendency of this proceeding, the attorney's biographic pages on [defense counsel's] website listed his representation of [plaintiffs] . . . as one of the major accomplishments of his career. How could the plaintiff or an impartial and objective outside observer ignore such a patent appearance of impropriety? . . . [T]he Court finds there is no evidence to suggest that there has been an improper exchange of privileged information. However, such a factual finding does not outweigh the appearance of impropriety. . . . The growth of multi-jurisdictional practice by law firms coupled with the increased mobility of practicing attorneys places added pressure upon law firms to deal with the issues raised in these Motions. However, the traditional and well founded concept of the appearance of impropriety cannot yield to the added expense and inconvenience inherent in the enforcement of longstanding ethical concepts. Judges themselves must not only avoid the appearance of impropriety but also instruct juries to do the same. No less should be expected of the attorneys who practice before the bar of this Court. " In a final written decision, the Board found claims of a patent directed to a stabilized formulation of GLP-2 unpatentable under 35 U.S.C. § 103(a). "That the inventors of the ’866 patent discovered that a particular GLP- 2 analog performs best with a certain combination of amino acid and sugar, namely histidine and mannitol, does not persuade us by itself that the subject matter of the claims of the ’866 patent is nonobvious. The preponderance of evidence of record shows that the identification of the optimal sugar and amino acid to add to a formulation for stability purposes was nothing more than routine experimentation. Here, in addition to the disclosures of [a 1999 journal paper] and [U.S. patent '216], we credit the testimony of [petitioner's declarant] and his analysis of publications authored by [patent owner's expert] that describe 'rational' design choices for excipients in lyophilized protein formulations in order to optimize the formulation. . . .Thus, we are not persuaded that this is a case where there were 'numerous parameters' to try so as to support a conclusion of nonobviousness. . . . [T]he use of histidine and mannitol in protein formulation was disclosed in the prior art and the experimentation needed to confirm the successful application with GLP-2 analogs was 'nothing more than [the] routine application of a well-known problem-solving strategy, . . . "the work of a skilled [artisan], not of an inventor."'" The court denied plaintiff's motion to reconsider an earlier order granting defendant's motion for judgment on the pleadings that plaintiff’s delivery notification system patent encompassed unpatentable subject matter. "[Plaintiff] argues that the Court engaged in impermissible hindsight bias 'by viewing the [patent] in light of the ubiquity of wireless messaging technology today,' instead of determining whether the limitations in the patent were well understood, routine, or conventional in the art in 1996, when the patent was filed. . . . [Plaintiff] misreads and mischaracterizes the Court’s holding that [plaintiff] has 'patented a method of delivery notification that is the equivalent of a method implemented ‘through a computer’ or ‘over the internet.’'. . . . The Court is permitted to take note of 'fundamental economic concepts and technological developments' when making a § 101 determination, observes that sending wireless page messages was well-known in 1996. . . . The patent sets forth steps by which conventional technologies (wireless paging systems) do conventional things (relay data and send messages through, in essence, a communications center) to achieve an abstract aim: notifying a customer if and when their package has been delivered." The court denied defendant's motion to preclude plaintiff's CEO from providing expert testimony due to his financial stake in the case. "[Defendant] moves to preclude [plaintiff's CEO] from testifying as an expert witness, based on his 'blatant and direct financial interest in the outcome of this case.'. . . [Defendant] analogizes this situation to one in which a retained expert will receive greater compensation depending on the outcome of a case, a situation in which some courts preclude experts from testifying. . . . [Defendant's] clever argument has some appeal, but ultimately fails. . . . Any recovery in this case will initially go to [plaintiff], not [its CEO]. . . . In the end, the Court concludes that [the CEO's] indirect financial interest in the outcome of the litigation . . . can be handled appropriately on cross-examination." Following the recent Federal Court decision in Electric Power Group, LLC v. Alstom S.A., 830 F.3d 1350 (Fed. Cir. 2016), the court reconsidered an earlier order that denied defendant's motion to dismiss because the asserted claims of one of plaintiff’s machine communication system patents encompassed unpatentable subject matter and, upon reconsideration, found that the claims lacked an inventive concept. "Most recently, the Federal Circuit, in Electric Power Group, has clarified that 'enumerating types of information and information sources' will not turn an abstract idea into one that is patent-eligible. In this case, the fact that the scope of the [patent] is limited to freight assets provides no inventive concept. Moreover, the [patent] does not require any components that could be considered an 'advance over conventional computer and network technology.'. . . Additionally, while in its initial assessment of the [patent], the Court expressly relied on 'the specialized monitoring features described in [the patent], coupled with the format translation,' Electric Power Group is clear that identifying parameters for monitoring does not constitute an inventive concept. . . . [T]he claimed invention does not solve a problem deeply rooted in the context of 'computer networks.' The issue of incompatibility in communication has existed as long as language itself." The court denied defendant's motion to dismiss on the ground that plaintiff’s zone dependent payout gaming management patent encompassed unpatentable subject matter because the asserted claim was not directed toward an abstract idea. "Determining game configurations (based on some set of rules, e.g., an algorithm, list, etc. ), generating game outcomes based on the configurations (based on some set of rules, e.g., an algorithm, list, etc. ), determining payouts based on game outcomes (based on some set of rules, e.g., an algorithm, list, etc. ), and crediting players based on payouts (accounting) are abstract ideas that can be conducted in one’s mind. At least one aspect of the process, however, requires activity outside of one’s mind: determining the physical location of the mobile gaming device . . . via the computer system. That is concrete enough to take the claim outside the scope of [Alice Corp. Pty. Ltd. v. CLS Bank Int’l, 134 S. Ct. 2347 (2014). ]'s 'abstract idea' exception to patentability under § 101. The location of the mobile gaming device via computer is a limited, concrete, physical task. . . . The integration of the non-abstract function of determining the mobile gaming device location via computer with the other processes for which the computer is used renders the invention as a whole patentable even if certain elements might not be separately patentable." The court denied defendant's motion to dismiss on the ground that plaintiff’s computer audio communication system patent encompassed unpatentable subject matter because the asserted claims were not directed toward an abstract idea. "The question of unpatentability of abstract ideas under [Alice Corp. Pty. Ltd. v. CLS Bank Int’l, 134 S. Ct. 2347 (2014)] is not whether an invention can be understood or described in the abstract, i.e., in one’s mind (any patent claim that could not be would fail for lack of enablement), but whether the invention can be practiced in the abstract (mathematical calculations, risk-hedging, etc). The Court is not convinced that Claim 1 is directed to an abstract concept. Rather, it is directed to a concrete, physical task. . . . [C]onverting sound to electronically stored information (and vice versa after transmitting data between two computers) is not something that can be done without the claimed apparatus (or a similar apparatus). The 'computer station' claimed here is not utilized simply for its generalized computing capabilities, i.e., its ability to substitute for a human mind, pencils and paper, etc. to perform an abstract task. On the contrary, Claim 1 uses the computer station for a particular, concrete method of communication inherently tied to a machine with particular physical capabilities. . . . Sound waves are not abstract concepts but fluctuations in air pressure in the physical world. Nor are electronic data packets abstract concepts." ​ The court granted defendants' motion to exclude the testimony of plaintiff's damages expert regarding apportionment as unreliable. "[Plaintiff's expert] essentially opines that the smallest salable unit of the Accused Products is the smartphone handset (not the internal chipset) and, in an effort to further apportion, constrains the total royalty base by a factor of one-tenth. He opines that this 10% factor adequately accounts for the proportion of total sales that is attributable to only the patented feature based on his review of results from two consumer surveys . . . that report that consumers value 'fingerprint scanning security' and 'data security and privacy.' Neither of the surveys seem to indicate customer demand for the digital watermarking technology. [The expert's] use of surveys is not unsound, but there is too great an analytical gap between the survey data and his apportionment factor of 10%, making his apportionment opinions excludable. . . . [The expert] did not separate out the patented feature and therefore did not adequately apportion. . . . He does not offer any 'credible economic analysis' to support his conclusion, making the 10% factor seemingly 'plucked out of thin air based on vague qualitative notions' and thus excludable." ​ The court granted defendant's motion to exclude the testimony of plaintiffs' damages expert regarding his choice-based conjoint consumer survey as unreliable. "[The expert's] study did not attempt to determine a real world price for the four patented features, and did not endeavor to value any non-patented features or to determine the value of the four patented features relative to the multitude of non-patented features in the accused devices. . . . The only tested features in [the expert's] study, apart from the unimportant language distracter, were the four patented features. Thus, the only 'value' expressed in [his] economic values is the relative value of the four asserted patented features to one another. [The expert's] conjoint results express nothing about the value of the four patented features relative to other important features of the accused devices. . . . [T]he Court will exclude [the expert's] conjoint study and testimony completely for a lack of relevance to the facts of the case based on [plaintiffs'] concession that [the expert's] conjoint study is unrelated to his other damage methodologies." The court denied defendant's motion to dismiss on the ground that plaintiff’s drone target tracking patent encompassed unpatentable subject matter because the asserted claims were not directed toward an abstract idea. "The asserted dependent claims include additional physical limitations. For example, Claim 6 discloses [an Unmanned Aerial Vehicle] with a 'plurality of rotors,' which is a physical component of the UAV, serving the function of 'generat[ing] lift.' Claim 7 discloses an imaging device coupled to the UAV, which is again a physical relationship between tangible components. These tangible claim elements suggest that the focus of the claims addresses more than just the abstract idea of automatic target tracking. . . . [Defendant's] characterization of the invention as 'automatic tracking of a target' also ignores the stated purpose of the invention, which is to provide solutions to several problems faced specifically in UAV technology. . . . [T]he claims at issue are not directed to an abstract idea within the meaning of [Alice Corp. Pty. Ltd. v. CLS Bank Int’l, 134 S. Ct. 2347 (2014)]. Rather, they are directed to specific improvements to the way UAVs can be operated to navigate under certain circumstances and to track targets." The court granted in part plaintiff's motion to compel documents and rejected defendant's argument that plaintiff was seeking documents for an improper purpose. "Defendant argues that it should be excused from producing documents because '[plaintiff] seeks documents for an improper purpose in order to obtain a competitive advantage.' Defendant has failed to demonstrate that producing appropriate documents marked 'Highly Confidential – Attorney Eyes Only' would be insufficient to protect its competitive interests. Moreover, parties are entitled to discovery of materials that are relevant to the claims and defenses and proportional to the needs of the case, without any inquiry into their subjective motive." The court denied defendant's motion for judgment on the pleadings on the ground that plaintiff’s glass recycling patent encompassed unpatentable subject matter because the asserted claims were not directed toward an abstract idea. "As a whole, the claims of the [patent-in-suit] describe a manufacturing process for recycling batches of mixed colored cutlet glass into glass bottles with desired properties. The claims require steps that the glass-maker must physically carry out -- he cannot simply use his mind or a pen and paper to perform them. . . . [Defendant] analogizes the [patent] to the one found invalid in [another case]. . . . [That patent] was directed to a method of updating alarm limits in a catalytic conversion process. . . . The court found that, at its core, the patent claimed only a method of measuring and calculating, using a mathematical formula -- an abstract idea that, without an inventive or physical application, was unpatentable. . . . Here, the [patent-in-suit] . . . claims a step-by-step industrial process for creating a one-color glass end-product from recycled, mixed-color glass. . . . In analyzing the specific claims of the [patent-in-suit], and using prior § 101 case law only as a lighthouse in a notoriously foggy area of the law, the court concludes that the [patent-in-suit] falls within the § 101 categories of patentable subject matter." The court granted defendants' motion for judgment on the pleadings because the asserted claims of plaintiff’s remote monitoring apparatus patents encompassed unpatentable subject matter and found that plaintiff was collaterally estopped from pursuing its claims as to one patent-in-suit after a related patent was found invalid in an earlier case. "[T]he Federal Circuit authority above suggests that collateral estoppel applies not only with respect to [the previously invalidated patent], but also with respect to [another patent-in-suit], which is largely duplicative of [the first]. While the Patents each span approximately 100 pages, both Patents in substance claim invention of a system for monitoring a vehicle or premises using two computers located remotely from the vehicle or premises: one computer that records audio or video from the vehicle or premises, and a second computer that receives audio or video information transmitted by the first computer via the Internet. . . . [T]he fact that the Patents may use 'slightly different language to describe substantially the same invention' does not defeat the application of collateral estoppel." The court denied plaintiff's motion for a preliminary injunction prohibiting the sale of the accused DNA sampling products because plaintiff failed to establish a likelihood of success on the merits due to pending inter partes review proceedings involving a related patent. "Plaintiff has not rebutted Defendants’ argument that pending IPR proceedings on claims in a related patent similar to those asserted in this case raise a substantial question about the validity of certain of the asserted claims in this case. 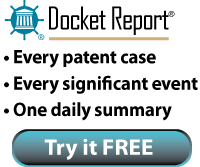 While the asserted claims of the [patent-in-suit] may not be identical in every respect to those currently under review before the PTAB, the Court finds that the claims are sufficiently similar to those in the related [patent] currently under IPR to raise serious questions about the validity of the asserted claims in this case." The court denied defendant's motion to dismiss on the ground that plaintiff’s MPEG decoder system patents encompassed unpatentable subject matter because the asserted claims did not lack an inventive concept. "[Defendant] argued that the Court could only consider the language of the claims when determining whether the claims contained an inventive concept. However . . . this Court can rely on 'the claims or the specification' to determine whether a combination of abstract ideas forms an inventive concept. . . . Here, the Court finds that [the claims] attempt to improve a technological issue. . . . As described in each specification, unary binarization can create codewords that are very long. In addition, a disadvantage of binary binarization is that the codewords become indistinguishable. . . . Unlike in [Alice Corp. Pty. Ltd. v. CLS Bank Int’l, 134 S. Ct. 2347 (2014)], the claims do not simply use general computers to perform abstract ideas; instead, the mathematical formula attempts to improve the functioning of compressing and decompressing video, images, and signals." The court denied plaintiff's motion to modify a preliminary injunction to require defendants to recall their accused products. "[T]hat request could entail substantial additional cost and harm to Defendants, and the ramifications of such an action have not been fully briefed. Moreover, Plaintiff was able to point to only one case in which a court took such a measure, ordering the recall of inventory that was sold lawfully prior to the entry of an injunction. The Court therefore declines to modify the order as such." Following a jury verdict of willful infringement, the court granted in part defendant's motion for enhanced damages and doubled the jury's award. "[Defendant's] conduct is egregious because it had direct notice from [plaintiff] and [plaintiff's] outside counsel of the [patent-in-suit] from the second month of the intense lengthy installation project with [defendant's customer]. [Defendant] estimated the entire installation at [its customer's facility] took 18-24 months and [defendant] and [its customer] were on notice of possible infringement for almost the entire duration of the project. . . . We do not find [defendant's] conduct so egregious to warrant treble damages under § 284 because two Read factors, closeness of the case and behavior as a party to litigation, weigh in [defendant's] favor." The court denied without prejudice defendant's motion to dismiss on the ground that plaintiff's intoxication monitoring patent encompassed unpatentable subject matter because claim construction had not occurred. "Defendant moves to dismiss Plaintiff’s complaint on the ground that the [patent] is directed to the patent-ineligible, abstract idea of 'using the results of a breathalyzer test to predict how intoxicated a person will be in the future'. . . . Plaintiff responds that the claims of the [patent] constitute a patentable improvement and transformation of an existing technological process — breath alcohol content analysis using a breathalyzer. . . . Given this dispute, the Court finds claim construction necessary to determine whether the [patent] is directed at a patentable concept because it claims an improvement to breathalyzer technology. Defendant’s motion is premature because the Court needs to construe material disputed claims in order to fully understand the basic nature of the claimed invention." The court denied without prejudice defendants' motion to dismiss on the ground that plaintiff's marketing system patents encompassed unpatentable subject matter because claim construction had not yet occurred. "Defendants argue that the claims at issue 'merely recite automation of traditionally mental and manual methods of using generic computer components and simplistic flow charts.' Defendants further argue that claim construction is not a necessary prerequisite given that all of the Asserted Patents would be directed to patent-ineligible subject matter 'under any reasonable construction,' and that the Court previously analyzed and construed the claims in each of their collective Asserted Patents during a prior case. . . . [T]he Court is persuaded that resolution of the issues urged in the motion is more appropriately addressed after the issuance of the claim construction order. The Federal Circuit has recognized that, as a general matter, 'it will ordinarily be desirable — and often necessary — to resolve claim construction disputes prior to a § 101 analysis, for the determination of patent eligibility requires a full understanding of the basic character of the claimed subject matter.'" The court denied defendant's motion for judgment on the pleadings on the ground that plaintiff’s electronic document encryption patent encompassed unpatentable subject matter because the asserted claims were not directed toward an abstract idea. "The patent's specification describes problems associated with 'typical' prior art encryption systems, such as incompatibility with EDMS systems and general difficulty of use. The [patent] purports to solve these problems using a method that the PTO determined was non-obvious over references considered during the ex parte reexamination of the patent. . . . Defendant's broad articulations of abstract ideas do not capture what claim 31 is 'directed to' because they do not take into account the two separate tables used to distinguish claim 31 over the prior art. Although not every difference between a purported invention and the prior art is necessarily relevant under a § 101 analysis, here it is plain from the reexamination prosecution history (with support in the specification) that the two-table limitations added during reexamination are sufficiently important that they must be included in any accurate description of the nature of claim 31 as a whole. . . . Moreover, encryption is a relatively sophisticated, computer-implemented method of protecting data, unlike the simple, human-executable method described in Defendant's analogy."